Jump Start Your Loan Modification / Loss Mitigation Business. Buy Fresh, Real-Time Leads Today! This year is shaping up to be a record-setter for foreclosures. Now is the time for you to grow your business and help families stay in their homes! The market is only getting bigger as the financial crisis drags on . Give us a call and let us show you how to use our leads to take your business to the next level. Comments: I want to save my house! What leads are best for me? Clients often ask us for tips on buying leads. We offer a variety of programs to help any size business succeed, from real time internet leads to batched files of aged data. We suggest testing a few different types of data in order to find your niche. For example, real time leads will close at the highest rate, but they will be the most expensive. Aged data is inexpensive, but requires more labor up front to find a deal. Give us a call at 1-888-219-8625 and one of our dedicated account representatives will walk you through the ins-and-outs of each type of lead to help you tailor a program to meet your needs. Ask your loan modification lead company where they are generating leads. Are you buying poor credit refinance leads and trying to turn them into loan mods? If so, the lead will not perform as well as those generated specifically for loan modification. Check out LoanModificationConnection to see where we generate our loan modification leads. 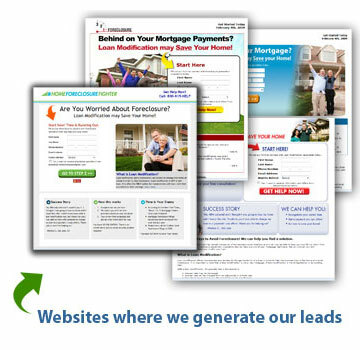 "I have tried leads from every lead provider and all types of leads and none of them compare to LoanModificationLeads.com's leads. I can actually reach people and they are excited to hear from me, hoping I can help them save their home. I highly recommend buying these leads. They work!" What is a loan modification lead? ©2019 by LoanModificationLeads.com. All rights reserved.